Gado-gado means campuran in Indonesia (or a mixture in English word ), is sort of like a salad, but most Indonesians usually eat it as an appetizer or sometimes even as the main dishes because it contains a lot of ingredients that would make you feel full. Therefore, this dish is tasty and healthy. I don’t know where Gado-gado comes from, but Surabaya has some interesting choices where you can enjoy a very tasty Gado-gado. 1. Prepare the sauce by frying the garlic and the chillies. Then grind or blend them with peanuts and kencur until the mixture is smooth. And then put in pan with other ingredients except fried shallots. Simmer over very low heat for 30 minutes, stirring to prevent sticking. Add some more water if it’s necessary. 2. 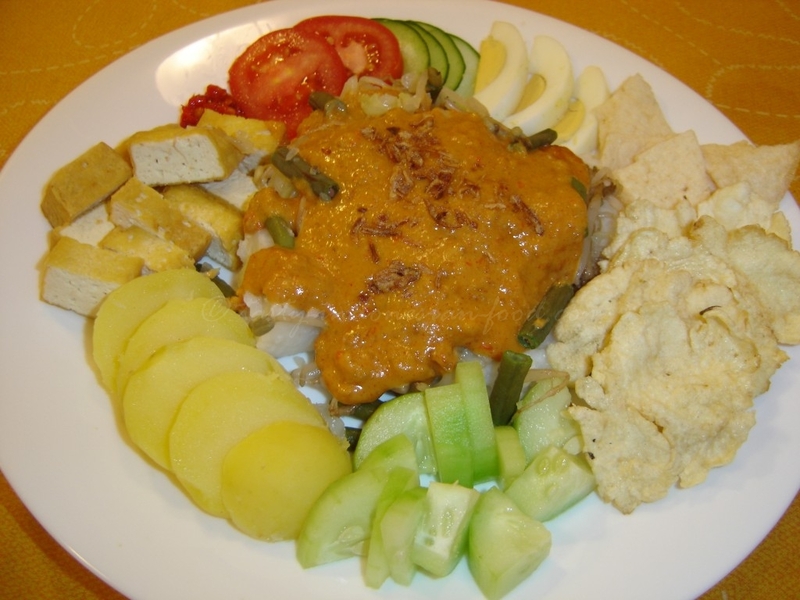 How to serve : First cut lontong, tofu and potatoes into small pieces, arrange them on the dish, then add all vegetables and krupuk, pour the sauce. Garnish with eggs, sprinkle with fried shallots.